In its paper, ‘The New Way’, Willis Towers Watson argues that the competitive advantage delivered by hedge funds is being eroded by structural, rather than just macroeconomic, constraints; principally the industry’s focus on “enterprise risk” rather than investment risk. Specialise and isolate - Managers are rarely best-in-class across multiple disciplines, so fund selectors should avoid over-diversified funds and instead identify managers that possess a unique competitive advantage in a precise area and isolate this specialist skill to create a solution. This might involve carving out the best elements from flagship/multi-strategy vehicles, free from the lower-conviction ‘risk management padding’ that can suppress returns. Proactively design - Investors should not simply accept the available products and should instead influence managers to create innovative new mandates, designed in the context of wider portfolios. By collaborating with hedge fund managers, investors can shift the managers’ focus from ‘enterprise risk’ (focus on the stability of base management revenues) back to investment risk, allowing an appropriate level of risk to be targeted. Deliver better value for money - Fee structures, expenses and all costs should be transparent and ensure alignment between the hedge fund manager and the end client. 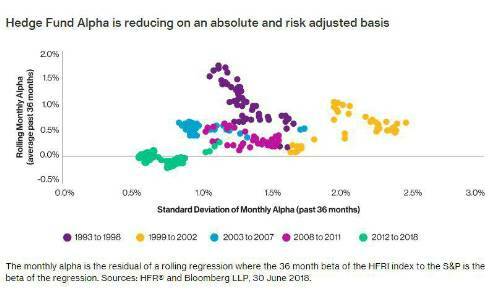 Managers should be paid for alpha, but fees should reflect the manager’s cost structure, the underlying strategy and the risk level. Sara Rejal, Global Head of Liquid Diversifying Strategies, commented: “We firmly believe that hedge funds continue to have a distinct competitive advantage and a clear role to play in institutional portfolios, largely due to their unconstrained investment mandate. The macroeconomic environment should become better-suited to hedge funds in the medium term. With the potential for slower and regionally divergent global growth, there are signs of market volatility with potential for greater downside risks, making equity and credit markets vulnerable to price falls. Indeed, central bank policy divergence has already commenced, and the correlation between stocks is not at historically low levels, implying a greater level of dispersion and a richer opportunity set. It is also the type of environment where hedge funds can improve the downside protection characteristics of a total portfolio.